Good Morning my friends at the 36th AVENUE. 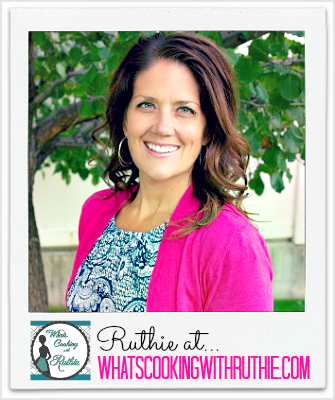 It’s Ruthie from Cooking with Ruthie and I love coming to visit with you all… thank you for having me! I can hardly believe that the holiday season is here. I LOVE the spirit of Christmas and making recipes to share with my friends and family is one of my favorite ways to share the love this time of year. SO, I brought my Holiday Pretzel Crisps, a very tasty and very simple to make recipe for you to share with your loved ones this year. 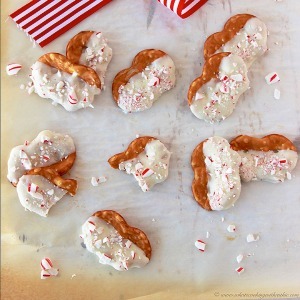 White chocolate dipped pretzels have been a long time family favorite of ours… then add on the crushed candy cane and they’re to-die-for delicious! In a small microwaveable bowl combine white chocolate chips and oil. Microwave for 30 seconds, stir, microwave 15 seconds, stir until smooth. Heat 15 seconds more if necessary. Place parchment paper on flat work surface. Using a spoon to help coat each pretzel ¾'s of the way. Let excess drip back into bowl. Set on parchemnt paper and sprinkle with crushed candy canes. Allow to cool and for chocolate set. Need a few other ideas for your sweet treat plates this year? Take a look at these recipes…. Happy Baking and Happiest of Holidays! What a cute and easy gift idea. I love it!